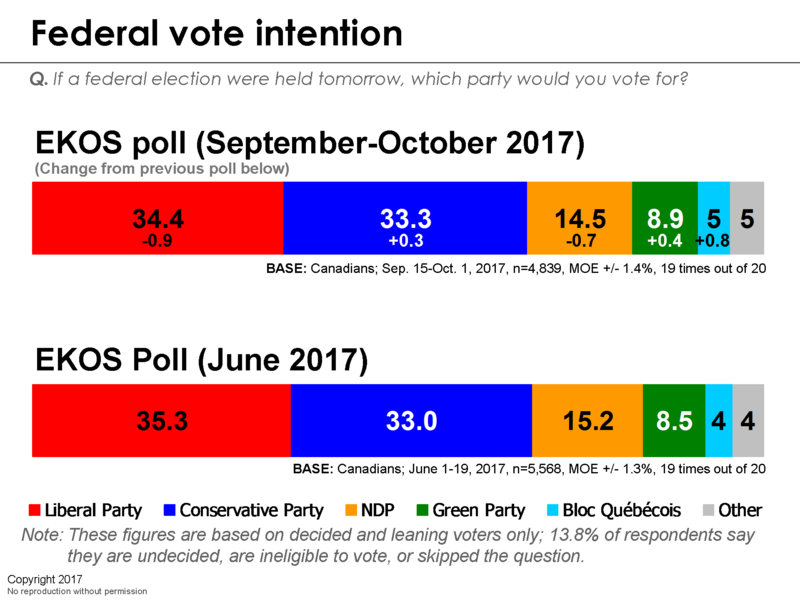 [Ottawa – October 3, 2017] The horserace has remained remarkably stable over the summer and the apparent oscillations and movements that one would gather from looking at different polls are not expressed in our research. Indeed, all five parties find themselves within the margin of error of where they were in June. At 34 points, the Liberals are holding steady and are statistically tied with the Conservatives, who are a mere one point behind. At 15 points, the NDP is in a distant third place, although this may change as the NDP’s new, dynamic leader, Jagmeet Singh, takes the helm. 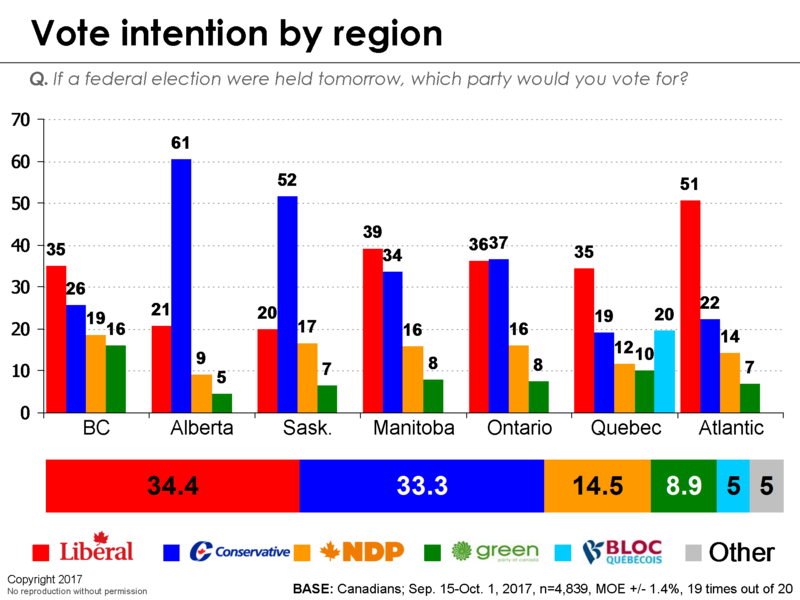 The Conservatives continue to dominate Alberta and Saskatchewan and the Liberals hold significant leads in Quebec and the Atlantic, as well as British Columbia, which is a remarkably competitive three-way race. The most important regional finding, however, is the new tie in the key battleground of Ontario. The gender split across Liberal and Conservative voters is once again quite prominent. The Conservatives lead with men, while the Liberals would likely win another majority if voting were limited to women. 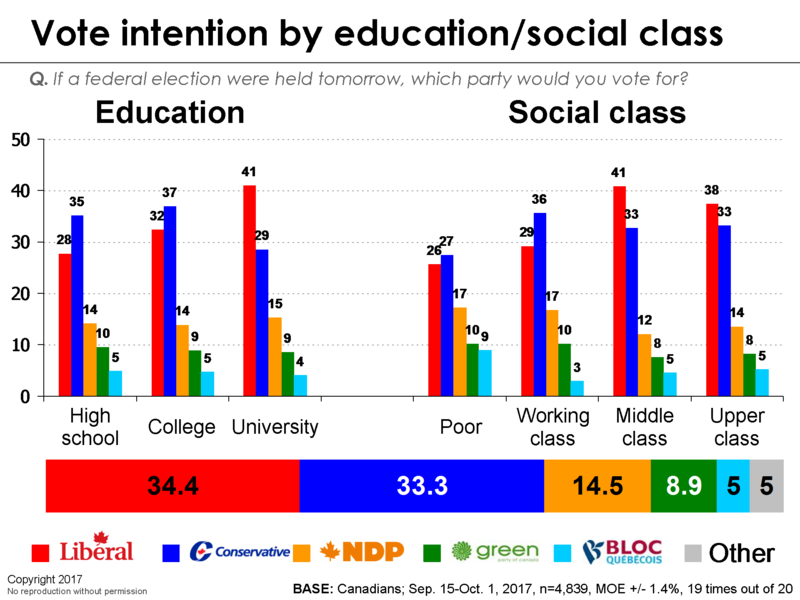 The Conservatives lead among the college educated, while the Liberals do best with university graduates and new Canadians. 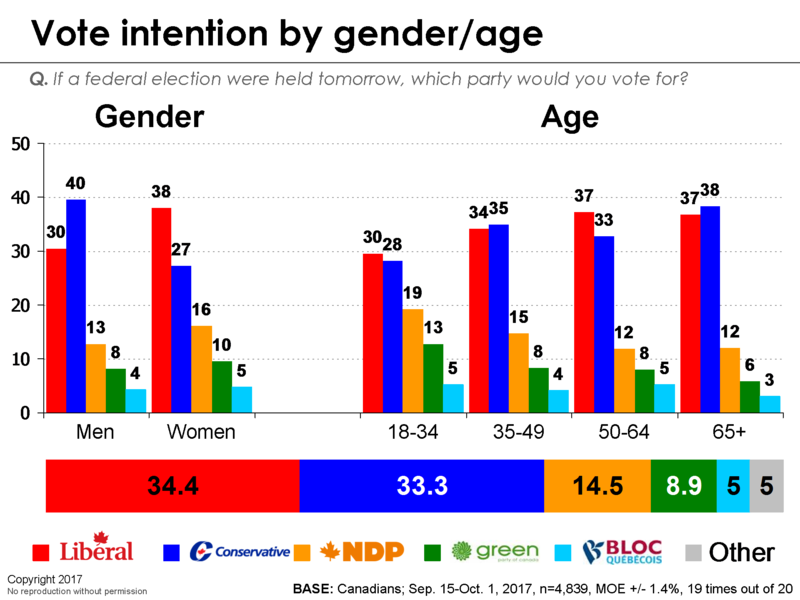 NDP support is inversely correlated to age and the party gets almost two-fifths of its support from those under 35. Could this be Canada’s Sanders/Corbyn progressive young voters segment? What is perhaps most interesting is the emerging class divisions between the two parties. The Liberals lead handily with the middle class while the Conservatives are finding their support increasingly concentrated in Canada’s working class. Indeed, it appears that the Conservative Party is no longer the party of the upper class, but rather the party of the working class. These shifts are eerily reflective of the trends that led to Donald Trump’s win. National direction: a tale of two Canadas? 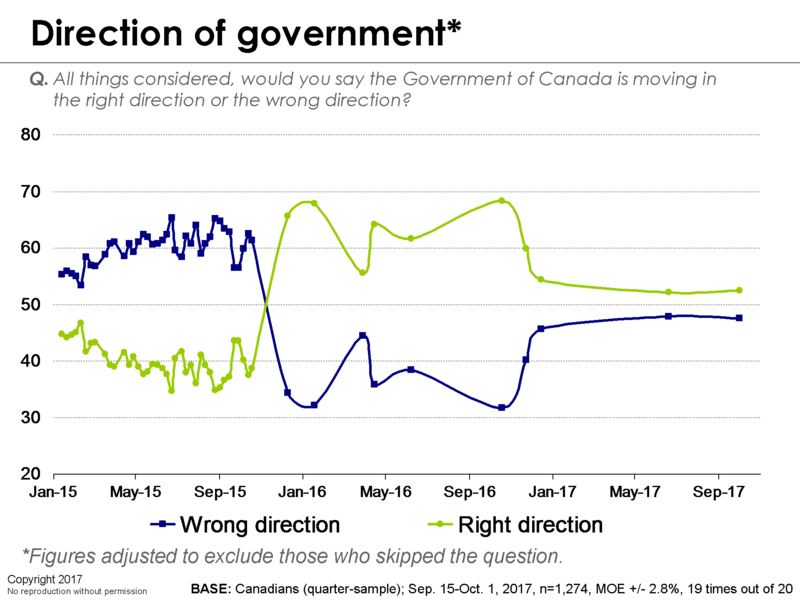 While the Liberals are well down from their post-election honeymoon numbers, the Trudeau government still enjoys net positive approval on both national and federal direction, which are now moving in lockstep with each other. We do, however, see large breaks across social class, education, and region, which are likely a product of partisanship. 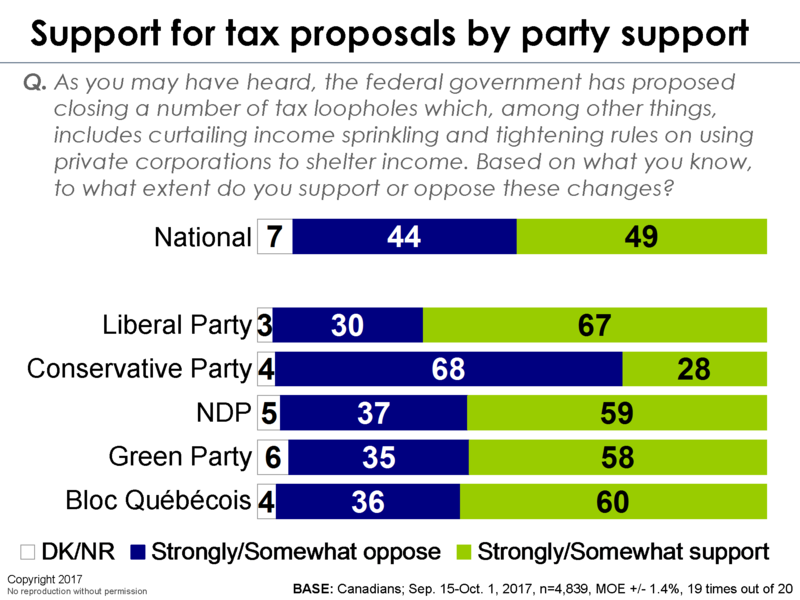 Liberal, NDP, and Green supporters are quite happy with where the country is headed, while Conservative supporters are downright fed-up. Furthermore, as we will see in an upcoming release, Conservative supporters hold a much darker view of the future, are more likely to have fallen behind, and are more likely to be working class (which, as we will show, is also more likely to have fallen behind). 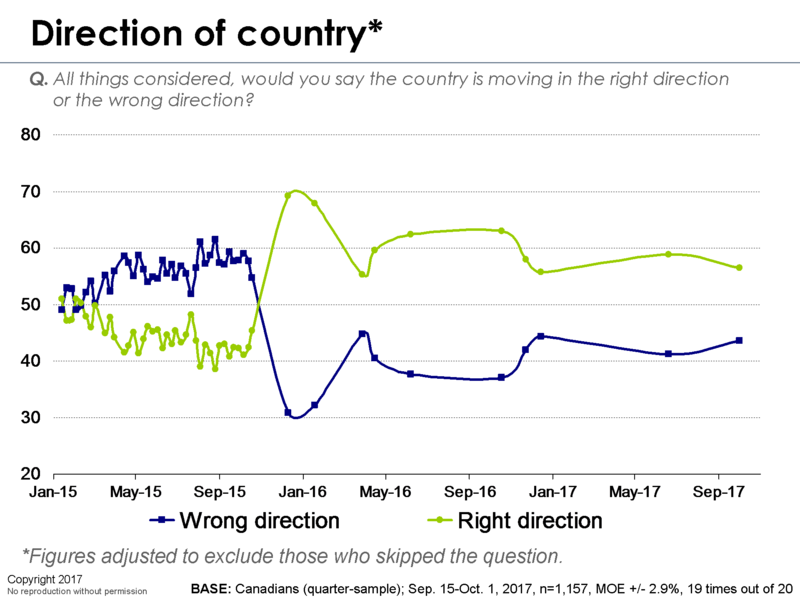 All of this suggests the emergence of two Canadas: happy Canada, who think we’re headed in the right direction, and miserable Canada, who think we’re headed in a tragic direction. Trust in government, meanwhile, is relatively stable and still quite high by historical standards. 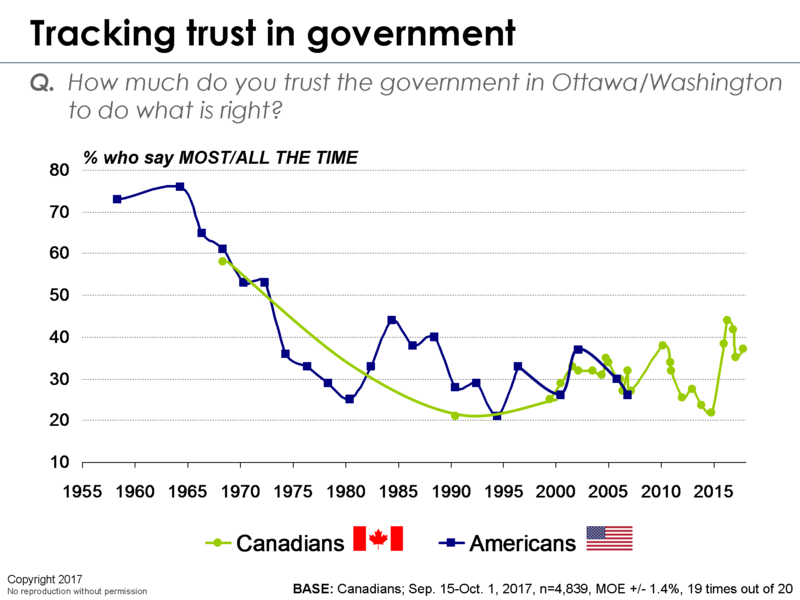 While trust may be down from this time last year, the Trudeau government is clearly not treading into the legitimacy crisis territory of the previous government. Turning to approval ratings, it would appear that Justin Trudeau has lost some of his post-election shine. 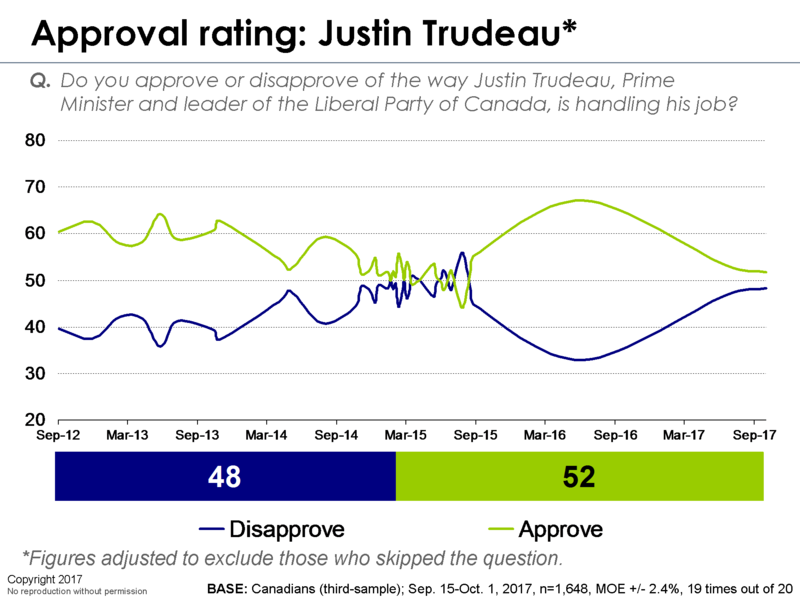 Nevertheless, the Liberal leader still enjoys a net positive approval rating and his numbers are still comparable to what he had going into the last election. 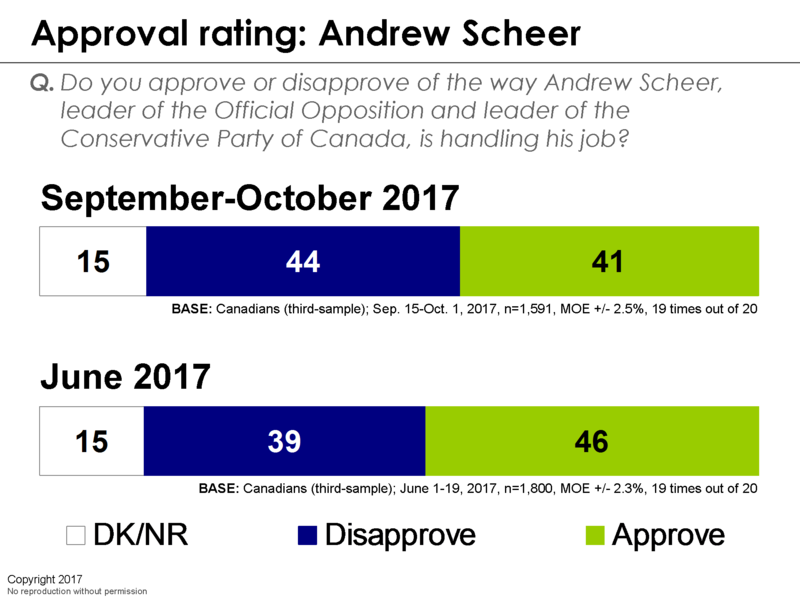 Andrew Scheer, meanwhile, has seen a discernable drop in his approval rating, although he still fairs considerably better than Stephen Harper. 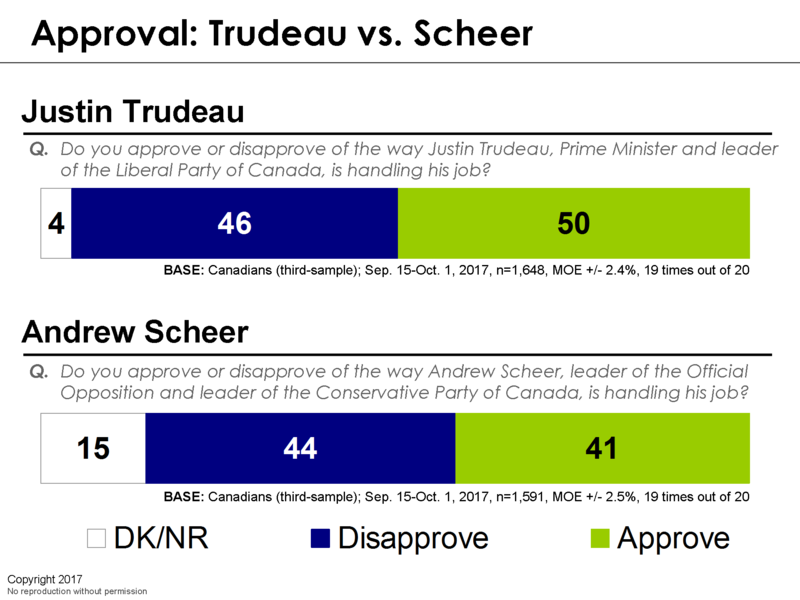 What is most notable, however, is that Mr. Scheer’s in-party approval rating stands at just 75 per cent (for comparison, Thomas Mulcair’s approval rating among NDP supporters was 68 per cent in June 2016, a month after his own party had voted him out ). It appears that Mr. Scheer has yet to convince his party’s rank-and-file that he’s the right leader in the same manner Trudeau convinced his supporters. 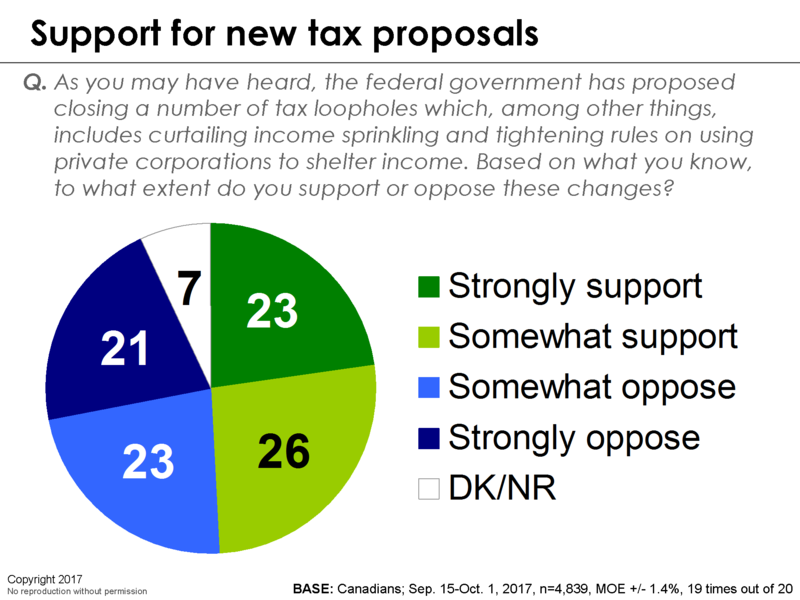 Finally, we’re going to close with a look at public attitudes to the government’s proposed tax changes. Now, a couple of important caveats are in order and initial reads should be taken with grain of salt. 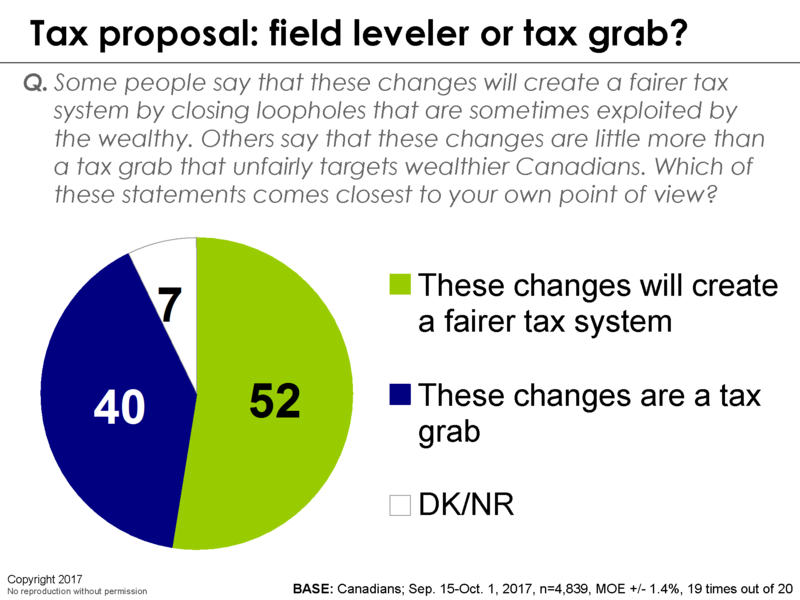 First, the proposed tax changes venture into some pretty complex territory and we were left with the unenviable task of communicating these changes to survey respondents in a ten-second sound byte. While we feel that our questionnaire provided a fair description of the changes, a more detailed and comprehensive overview might elicit different responses. Second, legislation could be changed to respond to some of the concerns about the unintended negative impacts and public opinion may evolve as the legislation changes. There is no question that these proposed measures have been the focus of opposition attacks on the government and have been received with something of a firestorm from business quarters and parts of the medical community. Given the vehemence of the initial response, some have speculated that the governing Liberals are being hurt by these proposals. In our view, this does not appear to be the case. 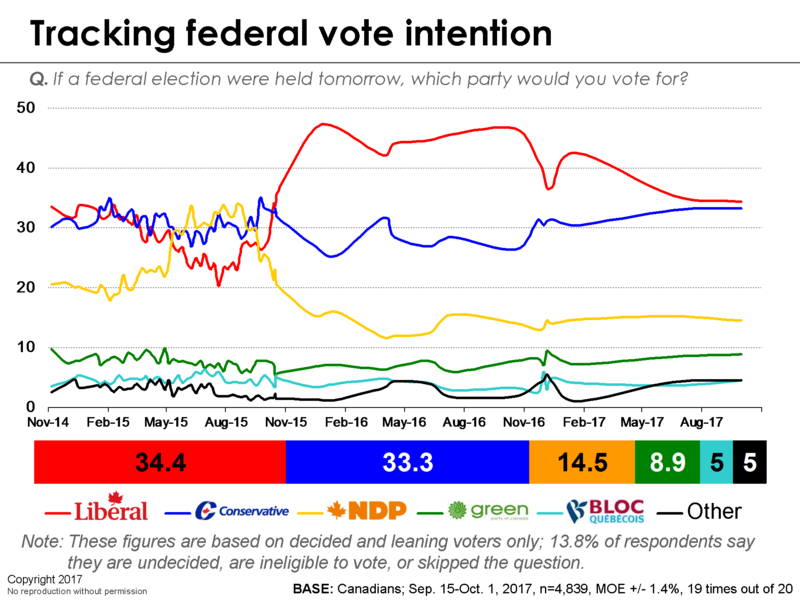 While it is the case that the Liberals are in a significantly weaker position than they were a year ago, the decline occurred over the spring, not the summer. These proposals are clearly divisive. But there is a slight lean to favour the government’s position. The opposition is very much concentrated among Conservative supporters. Support is more focused among the middle class (whom the Liberals have specifically targeted) but, interestingly, opposition is greatest among those who identify as poor. This finding ultimately circles back to our argument that the Conservatives are becoming the party of the less affluent and that the party is increasingly being shaped by the populist forces we’ve seen elsewhere in the Western World. The second question tries to look at what will be the key contest of the ‘narrative’ which frames the debate. Opponents will point to the changes as a naked tax grab unfairly targeted at hard-working entrepreneurs and professionals. The government and supporters will frame them as an exercise in restoring fairness and removing special benefits and loopholes available to already wealthy individuals. The battle over framing is by no means over but, at this early stage, it appears the government is enjoying even stronger support on the basic fairness framing. The locus of opposition on the framing question is almost exclusively concentrated among Conservative supporters. For a government which is experiencing some softening of its support, this may well be due to cumulative disappointments from the promiscuous progressive voters (who flocked to the party in 2015) over issues such as the government’s reversal on electoral reform and its sign-off on pipelines. In our view, these proposals have not hurt the government and may very well help shore up this exposed flank in the long run. Not to mention.that Liberal policies hurt the working class the most – ie raising taxes not to improve social security but to be spent on the nebulous “green energy” and other things. This is actually scary. I thought Canadians didn’t like Trump. At least from where I’m sitting, no one likes Trump. Why ever would anyone lean in the direction of electing a junior version of Trump? Because trudeau is incompetent and most of his decisions are hurting the working class. Also, I wasn’t aware that any “junior Trump” was running. I agree. It is scary to see Conservatives doing better. I thought after awful Harper years Canadians would have learned their lesson. Good news! Maybe Canadians are starting to wake up that electing Justin Zoolander was maybe not the best idea. And Mr Harper was good? We get mad at the Conservatives and vote in the Liberals. We get mad at the Liberals and vote in the Conservatives. We have done this for 150 years now and nothing seems to change. Insanity is doing the same thing over and over again and expecting a different result. We’re going to have to do something different in 2019 in order to get real change! I agree with you whole hardheartedly and never see why no other party has broken though yet.. maybe the green will make a mark.